Coverage: Live commentary on Radio 5 live sports extra and Radio Ulster FM, the BBC Sport website and BBC Sport app, with live text commentary online. 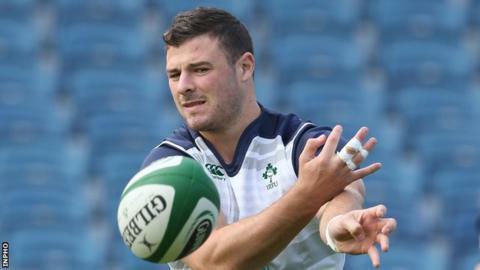 Robbie Henshaw has been ruled out of Ireland's opening World Cup game against Canada through injury, with Luke Fitzgerald named at inside centre. Henshaw pulled up in training this week with a slight hamstring problem. Iain Henderson's recent impressive form has been rewarded by coach Joe Schmidt with a starting berth alongside skipper Paul O'Connell in the second row. Prop Cian Healy is set to make his return from injury off the bench as Jack McGrath starts in the front row. Healy has not played since Leinster's Champions Cup semi-final defeat to Toulon last April, but has trained for the last number of weeks and should get an opportunity to prove his fitness. Rory Best and Mike Ross join McGrath up front for Saturday's clash, while the first-choice back row of Peter O'Mahony, Sean O'Brien and Jamie Heaslip line up together. Henderson was the standout player in Ireland's warm-up game against Wales on 29 August and he is offered the chance to make the number four jersey his own as Devin Toner drops out of the matchday squad of 23. Ulster winger Tommy Bowe pays the price for his poor display in the warm-up defeat by England at Twickenham as Dave Kearney gets the nod on the right wing. Meanwhile Rob Kearney returns from a knee injury to take his place at full-back, while Keith Earls is chosen on the left wing, with Simon Zebo providing cover on the bench. Scrum-half Conor Murray is also selected after recovering from the concussion he suffered when he collided with Joe Marler's boot at Twickenham a fortnight ago. It was Murray's third head injury inside a year but he is fit enough to link up with Johnny Sexton at half-back for the game at the Millennium Stadium. Canada's captain, Ospreys lock Jamie Cudmore, has not fully recovered from a knee injury and misses the game. Speaking at the announcement of the Irish team on Thursday, Schmidt indicated that he expects Connacht centre Henshaw to be available for his side's second Pool D game against Romania on 27 September. "At the end of training on Tuesday Robbie felt a tightness in his hamstring and when we had it scanned, there was a little bit of blood there," explained Schmidt. "He feels that tightness when accelerating and it would be a real risk to push him ahead. I'm quietly confident he'll be fit for next week." Ireland: R Kearney; D Kearney, J Payne, L Fitzgerald, K Earls; J Sexton, C Murray; J McGrath, R Best, M Ross; I Henderson, P O'Connell (capt), P O'Mahony, S O'Brien, J Heaslip. Replacements: S Cronin, C Healy, N White, D Ryan, C Henry, E Reddan, I Madigan, S Zebo. Canada: M Evans; J Hassler, C Hearn, N Blevins, DTH Van Der Merwe; N Hirayama, G McRorie; A Carpenter, J Moonlight, K Gilmour; J Cudmore (capt), B Beukeboom, D Wooldridge, R Barkwill, H Buydens. Replacements: B Piffero, D Sears-Duru, A Tiedemann, J Sinclair, R Thorpe, P Mack, L Underwood, C Trainor.